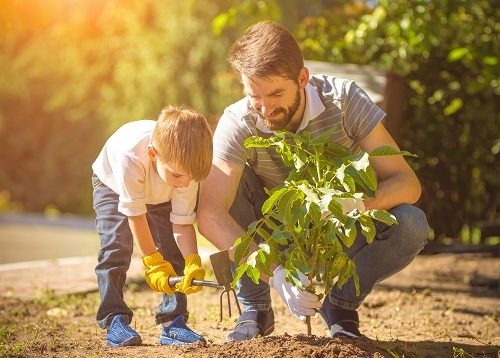 Year-Round Tree Tips From a Professional Arborist | Mr. Tree, Inc.
Can I Plant Trees Near My House? What is Tree Topping and Why is it Not Allowed in Portland? Having trees on your property can be a huge responsibility, which entails caring for and monitoring them year-round. You’ll want to rely on expert advice instead of trying to manage it on your own. Luckily, you can trust the professional arborists here at Mr. Tree in Portland, as we have over 30 years of experience and extensive knowledge of many different species of trees. Read on below to see our best tips for taking care of your trees all year long. Tree pruning is essential for the health of the trees and also prevents them from looking overgrown and unstructured. While some choose to prune on their own, it is usually recommended to use a professional, especially if you are inexperienced or want it to be done as carefully as possible. Know that if someone without the proper experience causes damage while pruning, that will affect the tree for its entire life. Overall, ornamental trees should be pruned annually, while evergreens can be pruned every 3 to 5 years. Throughout the year, you should generally be able to do light pruning and remove dead wood at any time. But a professional arborist will advise that certain times of the year are better than others. Some people may mistakenly believe that trees can just be left alone during the winter since it is a dormant season. However, many professional arborists agree that it is actually the best time to prune trees. This is because it promotes new growth when spring comes around. Also, the lack of leaves means it can be easier to tell which branches need to be removed. An important part of pruning is to know the tree’s overall structure and the barer a tree is, the easier that is to see. Pruning can also prevent the tree from causing damage during winter storms. Plus, it is easier for the trees to heal during the winter months. While pruning is essential for the trees, it also technically wounds them. This healing is what leads to better growth after winter is over. Once spring comes around, you can prune out any ice damage. One time of year that is not the most ideal to prune is in the fall. This is because trees take longer to heal that time of year, and it is also when fungus can spread rapidly. Of course, if branches are dead or severely decaying, you can still have those removed. If your intention is to enhance the trees’ flowering as much as possible, the best time to prune depends on when the trees bloom. If the trees bloom in spring, professional arborists recommend pruning when you notice that the flowers fade, which is usually in late spring or early summer. For those that bloom in summer, prune in late winter or early spring. In general, you should be sure to keep an eye on your trees year-round. You don’t want to ignore signs of damage that lead to major problems. Of course, there are issues that may not be obvious to the untrained eye. Professional arborists are able to provide an assessment of the condition, using their expertise to tell if the tree is a critical risk. Some signs of this are if it is cracked, rotting, or frequently losing branches. After the assessment, we will then give you advice on the best solutions to handle any issues, and tell you if it’s necessary to have the tree removed. At Mr. Tree, you can trust that we will always give you our honest assessment. Once again, the cooler months are an ideal time for this service. If harsh winter storms are expected later on, an assessment ahead of time, such as late fall, will let you know if the tree is able to handle those storms, or if it could be hazardous. One thing to look out for is if there are any branches that are close to power lines and in danger of falling. Winter can also cause a lot of damage so an assessment can also be done afterward. Trees can be removed any time of year, but when the ground is cold, removing the tree will have less of an impact on the surrounding vegetation. We also recommend an assessment to look for any unusual pest activity. The spring is a great time to inspect for this since that is the time when many insects become active. If you are interested in planting new trees, fall is a great time to do so. This time of the year will allow the new trees to establish roots in cooler, more moist soil. And once roots are established, the rain during spring and the warmth of summer will encourage growth. Especially when trees are newly planted, they need to be efficiently watered and have proper nutrients so that they can continue to grow. Making sure the trees get enough water is especially important in the summer when it can be drier. But you also need to be careful not to overwater. Mature trees usually do not need to be watered unless there are times of drought. Mulch around the roots will also boost growth as it retains water for the soil and insulates it from hot and cold temperatures. You can mulch in late fall and winter and then check on the mulch rings in spring and summer to see if more needs to be added. It is important not to overdo mulch. A 2 to 3-inch layer is ideal and you’ll want to make sure there’s some space between the trunk and the mulch. Too much mulch can lead to too much moisture, which could cause fungus to grow and other diseases. You can have the soil tested for nutrient levels, which will let you know how much fertilizer you may need. It is usually recommended to do a soil test every 1 to 3 years. Once you know how each season affects your tree, you’ll have a better understanding of how to take care of them year-round for a healthy, beautiful landscape. But keep in mind that it is always in your best interest to turn to an expert. If you have any questions, don’t hesitate to contact us at Mr. Tree. For more information on the professional arborists at Mr. Tree Inc., the services offered, and for additional tree tips, you can visit our website, www.mrtreeservices.com.